I’ve always liked roast chicken fairly well, although for a long time the main reason I made it was to be able to make chicken stock afterwards. The chicken itself didn’t seem all that exciting. Then I bought the Zuni Cafe Cookbook by Judy Rodgers (ostensibly as a present for J, but really of course for myself) and was enticed by her roast chicken recipe. I don’t have a wood burning oven like she does, and I find it difficult to find chickens small enough (the first time I tried it I had somehow found a two-pound chicken and it was ambrosial), but it still makes a chicken that’s downright exciting to eat. The keys to the method are: salting the bird thoroughly at least a day ahead of time, earlier if it’s a bigger bird; stuffing herbs under the skin – I like fresh bay leaves best; and roasting at very high heat. I usually start the chicken at 450° – if it’s a small one I keep it there, but if it’s bigger I generally turn down the heat to 400° after a few minutes, to make sure it cooks through before the skin crisps. I also turn the bird partway through cooking to baste the breast in the pan juices, then turn it back over for the last 10 minutes of roasting. This reliably turns out a chicken with moist meat, good flavor and fantastic salty, crackling-crisp skin. Anytime I skimp on the salting time it doesn’t turn out nearly as well. To go with the chicken, I roasted a pan of fennel and beets, and of course we needed wine. We like wine a lot, and try to keep a selection on hand for various moods and pairings. Sometimes we’ll have something special and plan a meal around it, but more often than not the food idea comes first, as was recently discussed over at Last Night’s Dinner. But this past year J was gifted with a membership in the Bonny Doon Winery DEWN club, so every few months we would receive two bottles of wine along with a little story and pairing recommendations. I actually found it hard to open those wines with just anything, I felt like I needed to actually make the dishes called for – just because the writeups were so emphatic. Very irritating, but we managed to drink the wines somehow. 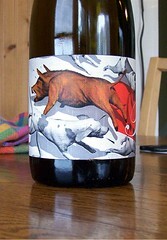 One of our last bottles from the club was a 2006 pigato, and the recommendation was for either seafood or pesto. We just weren’t getting around to it, and it was annoying me, so I decided at the last minute that we’d have it with this chicken. Then, to be an obedient little wine slave, I pulled some pesto out of the freezer and boiled up some egg noodles to go with it. Of course, it was great. The wine was very clear and light in the mouth, but with a full flavor that stood up beautifully to the herby chicken, the pesto and the sweet vegetables. Too bad we don’t have another bottle to try with seafood. I’ve tried making the Zuni Cafe Chicken at home once and it didn’t particularly impress me (although I didn’t use a high quality chicken). Then I had it at the restaurant itself and it was outstanding (easily the best roast chicken I’ve had although I didn’t particularly care for the bread salad). I might have to give it a try again even if I don’t have the wood fired oven (that has to be a significant part of the quality at the restaurant). I haven’t gotten to try it at Zuni yet, but I hope to sometime. I’ve gotten my best results at home with very small free-range chickens, but around here it’s hard to find an organic chicken under 5 pounds (no idea why). Getting the oven good and hot definitely helps, but if the chicken’s too big it won’t cook correctly. Why was the bread salad disappointing? I haven’t tried making it yet but it sounds great. I’m a sucker for chicken pan juices. I’ve sucked it up and started buying free-range all-natural chickens but I can’t stomach the price of the organic chickens yet (I’m refusing to try them for the reason that I might find out there that much better and insist of buying them). After trying the free-range chickens, the Foster Farms chickens I used to get are quite a disappointment. I will have to try the recipe again (sometime suitably well after Thanksgiving). I think the bread salad had too much vinegar on it for my taste and I wasn’t a huge fan of the greens. It also wasn’t particularly chickeny. We did, however, have plenty of chicken and potato straws (which were very very good) so I didn’t feel that I needed to eat it. It might’ve grown on me. I think it really wasn’t my kind of thing. 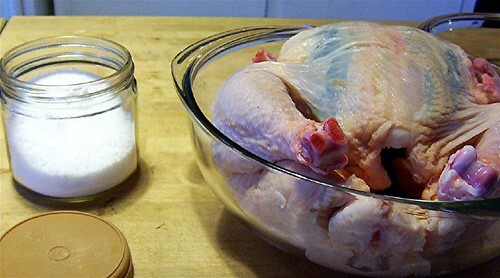 And, if you like chicken pan juices, try the recipe for Sauteed Chicken from Mastering the Art of French Cooking. The pan sauce you make with the chicken (don’t add the optional wine or vermouth) is beyond excellent. I like to just dip bread into the sauce and eat that (we make the meal just for the dipping sauce). Eventually I plan to make a post on it. Mmmmmm. I’ll have to try that pan sauce. Thanks for the recommendation. I think I will try the bread salad sometime. Maybe it just needs some tweaking.